Last month, the Architecture Museum in Caracas organized a series of conferences related with the finishing of the first cycle of “Espacios de Paz”, or Spaces for Peace, and the beginning of a second phase. According with its organizers, Spaces for Peace is a participatory design exercise, aiming to launch a process of physical and social transformation of conflicted urban contexts. The program is managed by PICO, a team of young architects, and has the support of the central government, represented by the high commissioner for peace. were built in six communities located in different Venezuelan cities: Los Mangos, in Valencia; El Chama, in Mérida; Pinto Salinas and Petare in Caracas, and Capitán Chico, in Maracay. Each community was assigned to a mixed team, with a national group of architects working along with an international one. Some of the international teams are well-known firms, as Al Borde, from Ecuador, and PKMN from Spain. 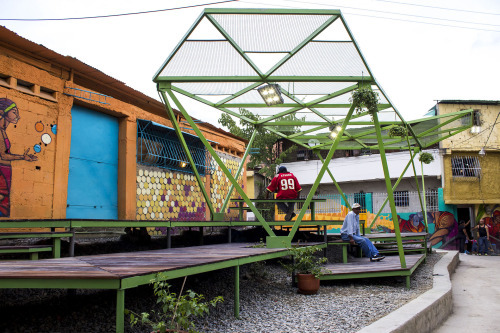 From Colombia came AXP Arquitectura Expandida, from Spain Todo por la Praxis, and from Mexico, Habitat sin Fronteras. Venezuela was represented by Abono, Oficina Lúdica, Plataforma de gestion de residuos de ciudad,439 Estudio ArquiUrbano and of course, by PICO. All the firms are young teams, with unconventional approaches to the practice of architecture, emphasizing mostly social and arty aspects. A second phase, with six new communities is now in progress, and the program has also started in Mexico. It is inevitable not to be captivated for the finished projects, much more, if, as myself, one has spent many years working in meticulous planning and consulting, with few concrete results to show. The pictures, depicting very appealing structures, with many happy people are certainly gorgeous. To see that is possible to get concrete results so fast is amazing and encouraging. Although hoping for the best, and wishing the organizers and communities a huge success, I would want to ponder certain aspects. Many of the beautiful structures seem strange to the sites as alien new inhabitants, far for the claim of one of the architects: A space built not only “for” the community but “by” the community. A vindication of the architect-worker, one more of the team, indistinguishable, who disguises itself, and joins to the process. Far from proposing that interventions in poor communities should be ugly or poorly built, I do believe that it is vital that they link with their surroundings and become examples of what people could build by themselves. Not only fancy camera-friendly objects. Other concern has to do with the selection of communities. There is no information about how it was made, or what criteria an interested community should meet to be included. It is inevitable to wonder if other than technical aspects were considered. For a pilot experience it is valid to choose based on such aspects of ease of access or friendly and complaisant people, but if the program wants to have a broader impact, the selection criteria should be clear and publicly declared. Finally, the fast process fails to solve the pressing and less fancy issues of public services, risks and structural compliance. It could be a wonderful tool for introducing professionals, hopefully not all architects, to a community. Nevertheless if we want to leverage the life conditions of the whole city, it has to be accompanied by other actions.